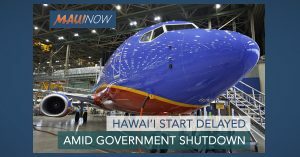 Southwest Airlines’ planned expansion of service into the Hawaiʻi market is suspended amid the now 34-day-old federal government shutdown. The airline is in its final phase of obtaining authorization from the Federal Aviation Administration for Extended Operations for service between California and the Hawaiian Islands. According to a the company’s fourth quarter report, Southwest Airlines estimates first quarter 2019 unit costs (excluding fuel and oil expense and profitsharing expense) to increase approximately 6%, compared with first quarter 2018’s 8.65 cents. “The year-over-year increase is driven largely by the Company’s underutilization of its fleet in first half 2019 due to the delay in its impending service to Hawaiʻi, and the resulting one-time start-up costs; higher airport costs; higher depreciation and ownership costs; and the timing of maintenance events and technology investments,” according to the company’s cost performance outlook.